Hawick councillor Watson McAteer at the old Hobkirk Primary School. A Bonchester school mothballed by Scottish Borders Council over a year ago is set for a fresh start under new legislation, it has emerged. Hobkirk Primary School was closed in November 2015 after a dramatic fall in pupil numbers. 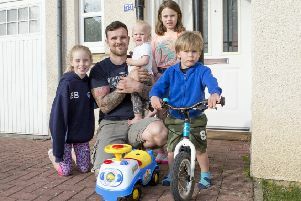 Five years earlier, the school roll had been 39 in two classes and a nursery, but when the decision to mothball it was made, only seven pupils remained, and parents asked for the remaining youngsters to be transferred to Denholm Primary. Now villagers are poised to use the new 2015 Community Empowerment (Scotland) Act to take over the building to use it as an as yet unspecified community resource. Hawick and Denholm councillor Watson McAteer believes the legislation will change the face of communities nationwide. He said: “Hobkirk school is currently mothballed while the education authorities complete the formal closure process. “The local community council is very actively pursuing options of taking over the redundant building from the council as an asset transfer, and the new Community Empowerment Act will help both organisations to make this happen. “While the community is yet to decide what they will use this asset for, this is a great example of exactly why this legislation has been introduced. Ahead of asset transfer requests coming into force later this month, Scottish Borders Council has already utilised the spirit of the legislation by helping the Hawick’s Men’s Shed group move from premises it had outgrown in Commercial Road, Hawick. The authority offered the group alternative accommodation in the offices of the former Lyle and Scott mill, in Lothian Street. Similarly, support has been offered to the town’s Escape Youth Services group by leasing a property in Havelock Street. The act aims to help community bodies grow through the ownership of land and buildings. It extends community right-to-buy legislation, making it simpler for groups to take over public-sector buildings. Crucially, the right-to-buy legislation is aimed at communities, such as Hawick’s, that have populations of more than 10,000. The latest stage of the legislation to be enacted, coming into force on Monday, January 23, covers asset transfer requests relating to land or buildings owned by public authorities. Mr McAteer said: “The Community Empowerment (Scotland) Act is a very real game-changer for public-sector organisations and, more importantly, for communities and individuals. “The asset transfer requests will help formalise and expand existing arrangements where the council and other public bodies can transfer ownership or lease land or property to local groups. “The council has already been very helpful in Hawick supporting Escape Youth Services and the men’s shed group.